Some Americans are connected to their guns like they are members of the family. But gun violence in all regions of the nation is giving policy advocates, citizens, and social workers reason to ask what is driving this serious and saddening public health problem. Editor's Note: The following article was written and submitted by the author in time to include an acknowledgement of the recent tragedy in Orlando, but it went to press before any legislative changes or major shifts in public opinion polls may have occurred. As Americans awoke June 12 to the horror of the shooting rampage at the Pulse nightclub in Orlando, no doubt many were reminded of how often they have had to watch similar tragedies unfold. Columbine, Virginia Tech, Aurora, Sandy Hook, Charleston, San Bernardino—the list seems endless. And along with the bloodshed, the tears, and the anger come renewed debates over gun control. Gun control proponents, including many social workers, have argued that the United States should become more like nations such as Australia and the United Kingdom that have instituted strict gun laws in the wake of mass shootings. However, the opposite seems to be happening in the United States. Firearm sales are booming, and politicians in some parts of the country are pushing for loosened gun restrictions, not tighter ones. What is going on? Exploration of this question reveals the great complexity of Americans' relationship with guns—a complexity that perhaps sets the United States apart from every other country in the world. 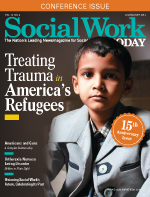 The more that social workers understand the nuances and factors that shape guns' role in American society, the more they may be able to find creative and effective ways to curb gun violence amid the political reality that sweeping gun restrictions in the United States are unlikely in the near future, if ever. "There's a lot that can be done," says Ron Avi Astor, PhD, a professor at the School of Social Work and Rossier School of Education at the University of Southern California. "It's about finding those cracks and niches where we can make changes." America: Mom, Apple Pie … and Guns? Guns play a much larger role in the lives of Americans than they do in the lives of people living in many other industrialized countries. There are more than 300 million guns in the United States (Horsley, 2016). The country accounts for less than 5% of the world's population but has 35% to 50% of the world's civilian-owned guns, according to Masters (2016), who cites a 2007 report by the Switzerland-based Small Arms Survey. Research by Lankford (as cited in Palazzolo & Flynn, 2015) shows that the United States accounted for nearly one-third of global mass shooters (defined as a person who killed at least four victims) from 1966 to 2012—a higher proportion than any other country. Schildkraut and Elsass looked at mass shootings that occurred in the United States and 13 other countries between 2000 and 2014. The United States by far had the most mass shootings during the period (133 of 166 mass shootings), although at least three European countries (Switzerland, Norway, and Finland) had higher rates of mass-shooting deaths per capita (as cited in Palazzolo & Flynn). The United States is often compared with other nations that have relatively strict gun laws, including Australia, the United Kingdom, and Japan. In many of these other nations, gun regulations were tightened in response to specific events or experiences that made the population averse to firearms. For example, the Port Arthur massacre in April 1996—in which a man shot and killed 35 people and wounded 23 others—compelled Australia's conservative-led government to enact a variety of measures that practically prohibited automatic and semiautomatic assault rifles, tightened licensing and ownership rules, and established a temporary gun buyback program (Masters). The United Kingdom enacted similar measures in the wake of the 1987 Hungerford massacre and the 1996 Dunblane massacre. Today, Australia and the United Kingdom have a much lower homicide-by-firearm rate than the United States—0.16 firearm homicides per 100,000 people in Australia, 0.06 in the United Kingdom, and 3.54 in the United States (Masters). In Japan, where most guns are illegal, the homicide-by-firearm rate is practically zero. Even with the United States' relatively lax gun laws and soaring homicide rates in some major cities such as Chicago, gun violence across the country overall has declined during the past two decades, particularly during the 1990s. • The overall rate of deaths by firearm per 100,000 people dropped from 15.2 in 1993 to 10.5 in 2014. • The homicide-by-firearm rate has been cut in half—from 7 per 100,000 people in 1993 to 3.4 in 2014. • The suicide-by-firearm rate dropped from 7.3 per 100,000 people in 1993 to 6.3 in 2010 before rising slightly to 6.7 in 2014. • The rate of nonfatal violent firearm crime victimizations fell from 725.3 per 100,000 people age 12 and older in 1993 to 174.8 in 2014. Despite these trends, most Americans believe gun crimes have increased or remained steady. A 2013 Pew Research Center survey found that 56% of Americans believed that the number of gun crimes had gone up over the past 20 years, while 26% said the number had remained the same and 12% said the number had declined (Krogstad). It would be easy to assume that because of the number of highly publicized mass shootings in the United States that Americans would be united in wanting to join their counterparts in other countries and enact strict gun control measures and remove guns from circulation. But that is not the case. The country's gun-makers produced nearly 11 million guns in 2013, double the number they produced in 2010 (Horsley). And survey data from the Pew Research Center show that more Americans have become pro-gun in their attitudes over the past decade. In the 1990s and early 2000s, a significantly higher percentage of Americans said it was more important to control gun ownership than to protect gun rights. But that gap in opinion has closed and, in 2014, support for gun rights reached a two-decade high, with 52% of Americans saying it was more important to protect gun rights and 46% saying it was more important to control gun ownership (Pew Research Center, 2015). Then in 2015, 50% of Americans said it was more important to control gun ownership and 47% said it was more important to protect gun rights (Pew Research Center). So, what is it about guns—or what is it about the United States—that has led many of its citizens and elected officials to recoil at the idea of further gun controls in response to mass shootings and incidents of gun violence? There is no clear-cut answer, but instead a combination of historical, cultural, societal, and political factors influence the debate. One factor is a practical one—that the U.S. Constitution includes a provision that protects gun rights. Since 1789, only nine countries have had a constitution that included an explicit right to bear arms. Only three constitutions (those of the United States, Mexico, and Guatemala) of nearly 200 constitutions worldwide currently contain such a right (Elkins, 2013; McCormick, 2013). "If it wasn't for the Second Amendment, I think legislators would restrict guns more," Astor says. "That makes things more complex here." Many Americans' current attitudes toward guns can be traced to America's history, or lack thereof, says Bob Tupper, who has taught history and U.S. government classes for 46 years at Holton-Arms School, a college-preparatory school for girls in Bethesda, MD. Today's Americans are only about a century or so removed from the country's frontier days, when guns were necessary for protection from wild animals and other threats. In comparison, many other countries went through their frontier periods much earlier, and memories of that time have faded from their citizens' collective consciousness. The hallmarks of the frontier attitude—determination, independence, and self-reliance—still wield a lot of influence on American culture. Tupper remembers the vast number of Westerns and detective stories that dominated television and movies when he was growing up. "These people with guns were heroes for us," he says. Another factor is many Americans' penchant for believing conspiracy theories. American history is full of political assassinations and other events in which official explanations have been rejected as cover ups. Such thinking feeds beliefs that citizens need guns to defend themselves against the government or a rogue U.S. Army, Tupper says. American culture's focus on meritocracy and individual attribution contributes to the attitude that gun rights are individual rights that must be protected, says Shabnam Javdani, PhD, an assistant professor in the department of applied psychology at New York University's Steinhardt School of Culture, Education, and Human Development. Individual accomplishment is lauded in everything from academics to sports to reality TV shows. Struggles are blamed on an individual's failings. Research demonstrates that America's long-standing tradition of individualism may be a factor in explaining why gun-control measures often face opposition. Celinska (2007) studied how the tension between individualism and collectivism affects the prevalence of gun ownership among Americans and their attitudes toward gun control. Examining data from the General Social Survey—a sociological survey designed to keep a historical record of Americans' attitudes, beliefs, experiences, and practices—Celinska found that gun owners and people who oppose gun control tend to hold individualistic values. Americans' focus on individualism also may explain the mantra of "guns don't kill people, people do" and the belief that further gun restrictions would not be effective in deterring gun violence, suicide, and unintentional injury, according to Lindsay Wiley, JD, MPH, an associate professor of law at the American University's Washington College of Law in Washington, DC. "[For example, if] someone has decided to commit suicide, so this thinking goes, they're going to do so whether they have easy access to a gun or not," Wiley wrote in an e-mail to Social Work Today. Politically, the National Rifle Association's (NRA) influence on the gun control debate cannot be ignored, says Melvin Wilson, MBA, LCSW, manager of the department of social justice and human rights at NASW in Washington, DC. Gun rights groups, including the NRA, spent approximately $31 million in campaign contributions and lobbying activities in 2013 and 2014 (Horowitz, 2015). Gun control groups spent approximately $4.5 million during the same period. And the NRA's reach extends beyond America's borders. It has opposed gun control measures in other countries such as Canada and Brazil and efforts to combat the illegal firearms trade in the belief that such measures could threaten gun rights in the United States (Cukier, 2013). "The elephant in the room is the [NRA]," Wilson says. "To get politicians to go against the NRA, especially if they've received money from [the organization], is virtually impossible." Given the variety of factors at play in the gun control debate, it is unclear whether many Americans' aversion to gun control will change anytime soon. Astor believes that the recent spate of terrorist attacks in Europe may make it more likely that other countries will think about loosening their strict gun control measures rather than politicians in United States looking for inspiration from abroad for tighter restrictions. But Tupper says the progress the United States has made in recent decades on other issues such as gender equality and gay rights should provide at least some hope for gun reform advocates. No matter the current political climate, social workers must remember that they are far from powerless in their fight to curb gun violence in their neighborhoods and communities, Wilson says. "We need to have skin in the game and say that something needs to happen," he says. "You can't be passive and not say anything." Wilson suggests that one thing social workers can do is to help reframe the gun debate to one focused on public health and to advocate for the reversal of the long-standing ban on federal funding for gun violence research. If the Centers for Disease Control and Prevention could do research that results in data showing how gun violence affects individuals, families, and communities, Wilson says, that may at least spark some self-reflection among people on both sides of the gun control debate about what remedies would be most effective. Astor says that instead of getting caught up in never-ending debates about what the Second Amendment does or does not say, social workers should start looking at issues related to gun violence where there is potential for consensus. Astor, whose research focuses on school violence, believes one area where consensus could be built is the issue of weapons in schools. So much emphasis is placed on school shootings that it is nearly ignored that a significant number of students bring weapons into schools every day, know other students who bring weapons into schools, or are threatened by other students with weapons. Countering this culture of violence by creating positive school environments where there is no place for weapons is something even a gun-rights advocate could support, Astor says. Some social workers and human services professionals are trying to stop gun violence one person at a time. One World Counseling, a community-based outpatient treatment program in Brooklyn, NY, has a specific treatment track focused on the issues of peace and resolution. The track is designed to help clients who have a history of violence reflect on the impact that violence has had not only on other people but also on themselves, says Dmitri Oster, LCSW, CASAC, One World Counseling's program director. "When clients are engaged in some of these violent behaviors, they also are damaging themselves," he says. "When we introduce this framework, it really helps [clients] tap into their own inner world and how they harm themselves, and that helps them build empathy [for others] down the road." Javdani is collaborating with the Citizens Crime Commission of New York City on a pilot program that trains community members to recognize when threats, bullying, and other aggressive action on social media may lead to violence in the real world. The idea is that by being able to recognize high-risk social media behavior, community members can step in and promote more positive resolution of problems and conflicts. "It's about pressing the pause button on some impulsive thinking," Javdani says. No matter what actions social workers take to try to curb gun violence, the important thing is to keep the conversation going and to not assume that the gun debate is one that can't be resolved, Wilson says. Wiley agrees that open dialogue is key. "Talk about the issues," she urges. "Try to see them from the perspective of people with experiences different from your own." Celinska, K. (2007). Individualism and collectivism in America: The case of gun ownership and attitudes toward gun control. Sociological Perspectives, 50(2), 229-247. Cukier, W. (2013). The NRA's hemispheric reach. Americas Quarterly. Retrieved from http://www.americasquarterly.org/content/nras-hemispheric-reach. Elkins, Z. (2013, March 7). U.S. gun rights truly are American exceptionalism. Bloomberg View. Retrieved from https://www.bloomberg.com/view/articles/2013-03-07/u-s-gun-rights-truly-are-american-exceptionalism. Horowitz, E. (2015, June 19). Gun rights lobbyists netted 7 times the money as gun control counterparts. Boston Globe. Retrieved from https://www.bostonglobe.com/news/nation/2015/06/19/tracking-influence-gun-rights-lobby/wIdnirHWAqdHh6AslPXzGI/story.html. Horsley, S. (2016, January 5). Guns in America, by the numbers. National Public Radio. Retrieved from http://www.npr.org/2016/01/05/462017461/guns-in-america-by-the-numbers. Krogstad, J.M. (2015, October 21). Pew Research Center: Gun homicide steady after decline in '90s; suicide rate edges up. Retrieved from http://www.pewresearch.org/fact-tank/2015/10/21/gun-homicides-steady-after-decline-in-90s-suicide-rate-edges-up/. Masters, J. (2016, January 12). U.S. gun policy: Global comparisons. CFR [Council on Foreign Relations] Backgrounders. Retrieved from http://www.cfr.org/society-and-culture/us-gun-policy-global-comparisons/p29735. McCormick, T. (2013, April 5). How many countries have gun rights enshrined in their constitutions? Foreign Policy. Retrieved from http://foreignpolicy.com/2013/04/05/how-many-countries-have-gun-rights-enshrined-in-their-constitutions/. Palazzolo, J., & Flynn, A. (2015, October 3). U.S. leads world in mass shootings. The Wall Street Journal. Retrieved from http://www.wsj.com/articles/u-s-leads-world-in-mass-shootings-1443905359. Pew Research Center. (2015, August 13). Continued bipartisan support for expanded background checks on gun sales. Retrieved from http://www.people-press.org/files/2015/08/08-13-15-Guns-release.pdf.